"I think I understand why that happened," President Trump said Thursday, reflecting on a change in North Korean behavior that prompted him to cancel a planned summit with Kim Jong Un in Singapore on June 12. When a reporter asked him to elaborate, the president declined. Until recently, the prospects of a summit were high. Experiencing the consequences of debilitating sanctions under President Trump's "maximum pressure" campaign, Kim Jong Un signaled a new openness. North and South Koreans marched together in the opening ceremonies of the Winter Olympics. Kim pledged to suspend missile testing and destroy an already-disabled nuclear facility in advance of talks. And most important, at the beginning of May, Kim freed three American hostages in what Trump would describe as a "beautiful gesture" that "was very much appreciated." In early May, around the same time the hostages were released, Kim flew to Dalian, China, where he met for two days with Xi Jinping. We don't know what the Chinese dictator and Kim said to each other. But we do know that, by the end of the meeting, the North Korean tyrant was backing away from his gestures of conciliation. The two governments issued a statement saying North Korea was open to giving up its nuclear weapons "as relevant parties eliminate the hostile policy and security threats" against its government. And in the weeks that followed, North Korea became increasingly belligerent, antagonistic toward key Trump officials, and, according to Mike Pompeo, uncommunicative. Was the bilateral meeting a fool's errand to begin with? Probably. Did John Bolton and Mike Pence's references to the "Libya model" of complete, verifiable, and irreversible denuclearization spook the Communist apparatchiks? No doubt. Does Trump's decision to withdraw put Kim and Xi on their heels? Absolutely. We are dealing with both North Korea and China here. Beijing's warnings that it cannot "control" Kim notwithstanding, the two governments function in a close alliance. North Korea would not exist without Beijing's support. And Beijing protects North Korea precisely because it fears nothing more than another democracy on its borders. For the Chinese, one Mongolia is enough. If you doubt me, look up the history of the Korean War, the Vietnam War, Taiwan, and Hong Kong since the transfer of sovereignty from the United Kingdom. We don't have a North Korea problem. We have a China problem. North Korea is a wild dog—China holds the leash. To change North Korea's behavior, change Chinese behavior first. Trump has done this before. Beijing's accession to U.N. sanctions against the north last September was the beginning of détente. By spring 2018, however, China was beginning to fear that something might actually come of the Trump-Kim bromance. With events moving so quickly, and Beijing finding itself largely left on the outside, analysts said China and its leader, Xi Jinping, must at least consider what they called worst-case contingencies. "The loss of prestige is a big problem for China and Xi, who wants everyone else to view China as an essential actor of international relations, especially in the Northeast Asian context," said Zhang Baohui, a professor of international relations at Lingnan University in Hong Kong. "Now, suddenly, China is no longer relevant." Well, China became more relevant in the weeks after the Dalian conference. North Korea became more recalcitrant as China's trade delegation to Washington, D.C., pressured the administration to relieve sanctions on tech giant ZTE and back off from its threat to impose tariffs and restrict investment. Beijing was testing how far it could push Trump. Could it make him back off his demands for complete denuclearization of the peninsula, leave John Bolton and Mike Pence in the Beltway, and stand down from his threats to renegotiate Sino-American trade? The test failed. The summit is canceled. ZTE and trade are both unresolved. 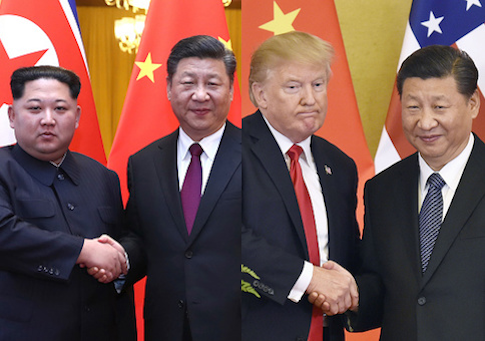 We are left where we were earlier this year, as foreign capitals attempt to make sense of Trump's strategic ambiguity (the "Madman Theory" of foreign policy), "maximum pressure" grinds down what remains of the North Korean economy, and China and America eye each other warily. It is this confrontation, between Washington and Beijing, which will determine the course of the 21st century. And as recent events have demonstrated, the confrontation is not merely geopolitical. It is also geo-economic. Just as China has participated in a shadow play of peninsular diplomacy, forever pledging North Korean denuclearization without any results, it has done a song-and-dance on trade policy, promising to open its economy as the U.S.-China trade deficit grew from $82 billion in 2000 to $337 billion in 2017. On every front—social, cultural, economic, diplomatic, and military—China is working to subvert America's position in the Pacific and ultimately force us out of the region. The North Korean gambit is a part of that strategy. Trump was right to call the bluff. To change the power dynamic in the region, however, he must go further. Continue sanctions against the north, and build up our military assets to maintain deterrence. Support the democratic government in Taiwan. Above all, target the real pillars of Chinese power: the forced technology transfer, discriminatory licensing restrictions, state-coordinated outbound investment, and cyber-theft and intrusion through which the Communist dictatorship has amassed its fortune—and threatened the future of freedom. This entry was posted in Columns and tagged China, North Korea, Xi Jinping. Bookmark the permalink.